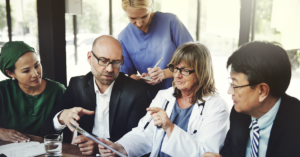 An effective physician recruitment strategy embraces both the science of systems, technology and data as well as the art of building relationships, engaging your internal team, and delivering a superior experience to candidates. Engage your team. The key to success of every recruitment program is the support of a highly engaged hospital CEO and senior leadership team who understand that physicians and advanced practice providers are the number one asset of the hospital. A genuine culture of transparency builds a foundation of trust. Making recruitment and retention the top priority ensures that hiring decisions move faster, which is critical in the competitive physician recruitment arena. If you effectively prepare your interview team and the candidate for a well-organized site visit, you will keep everyone engaged! Deliver an unparalleled physician experience from sourcing to signing (and beyond). Even with few resources, you have the opportunity to define and deliver the red carpet treatment for your candidates and their families. This can range from paying attention to the simplest details of dietary preferences to making charter flights available to ensure that a candidate spends minimum time in transit if your location not near a major airport. Your goal is to enable them to envision their future with you by focusing their visit on learning the benefits of the practice, absorbing the healthy organizational culture and experiencing the charm of the community. Think outside the box when it comes to incentives. Adopt a mindset of focusing on what you can control and do. Rather than fixating on an incentive you cannot provide, tailor your package to make your opportunity relevant and attractive to your top candidate. A true incentive provides a positive motivational influence and differentiates your organization. If you are offering the same package as others, it becomes an expectation, not an incentive. Examples of unique (and personal) perks might be a share in a private charter air service or relocation services that will ensure a smooth transition for their entire family. Access newer recruitment technologies and techniques that provide a competitive recruitment edge. With the goal to reach a wider pool of physicians – particularly passive physician candidates – social media tools and digital networking resources become a necessity. The right digital recruitment technology enables recruiters to customize outreach and laser-focus their efforts to identify “best fit” candidates. Measure your improvement in recruitment performance and return on investment. As you innovate your recruitment process, you will reduce your costs of recruitment by accelerating sourcing, streamlining candidate selection, eliminating redundant or unnecessary activities that create bottle-necks and waste time for both the candidate and the recruitment team — and ultimately reduce your time-to-hire. Use the data you collect through your scientific and data-driven recruitment process to benchmark your recruitment metrics and improve your ROI. Jackson Physician Search is experienced in developing recruitment partnerships with physician groups, hospitals, health systems, rural health centers and other organizations of all sizes across the U.S. As partners, we leverage our experience and technology to build proven recruitment systems that include continuous sourcing, efficient communication and timely decision-making to produce consistent, successful results over the long-term. Our track record and resources enable our clients to achieve success in finding, hiring and keeping physicians to serve their communities. Learn more about how we work for you or Contact Us to discuss your objectives and let us provide solutions to tough recruitment and retention challenges.